Any gourmet living in Lyon or visiting France’s food capital salivates watching Sève’s window bakeries full of pink praline tarts, macaroons, chocolate pastries and christmas logs. One of the few bakeries to make its own chocolate has just opened a museum in a brand-new factory located in the northwestern suburb of Limonest (10-km from Lyon). Let’s embark on an exotic and gourmet journey in Lyon with the pastry chef as special guide. Going to MUSCO, as the museum is named, is an early christmas gift for local foodies and tourists eager to taste fine chocolates while learning about the cocoa culture and an old-fashioned making process. Visitors are stunned from the get-go as they hear the purring of machines, smell cocoa and roasted bean aromas while observing a series of items inspired by Richard Sève numerous trips to Central and South America (or that he and his wife Gaëlle Sève brought back) like a pirogue from Brazil. “Our desire is to show customers how we make our chocolate here from cocoa beans we select ourselves by visiting plantations to chocolate bars obtained through a traditional process which is so unusual as most pastry chefs get their chocolate from large industrial factories”, Richard Sève told This Is Lyon. A curiosity cabinet has been recreated with several heads of King Pakal (a famous monarch who ruled the Maya’s city-state of Palenque in the 7th century) and traditional headdresses from Brazil tribes working with the bakery. In this museum the public learn about the history of the cocoa culture with a focus on pre-Columbian civilizations. “The exhibit shows how Mayas and Aztecs ate and used cocoa during rituals which associate cocoa to men and corn to women”, Richard Sève explains. The exotic setting is a testimony of the closed relationships they developed with local farmers. “Instead of buying cocoa beans on global markets benefiting traders who don’t know too much about beans, we prefer to reward farmers who cultivate exceptional products”. Sitting on bean bags, visitors watch a movie featuring an old Mexican plantation where the farmer has replanted a rare variety of cocoa bean known as white criollo bean. 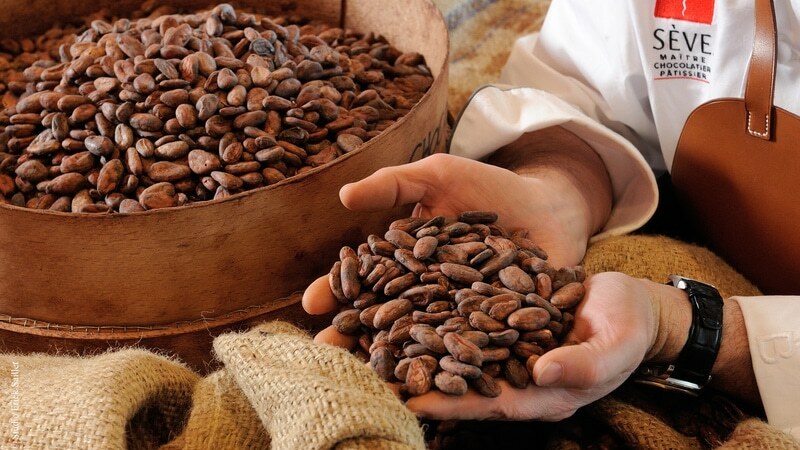 “The cocoa grower sent me 1.5 ton of these exceptional cocoa beans (everything he had) to make a chocolate that has the color of a milk chocolate but without milk chocolate in its composition”. 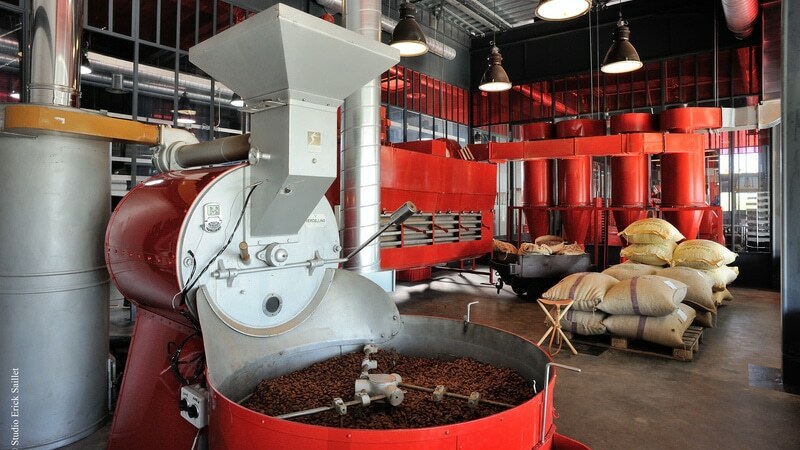 The sober, contemporary 1500 m² building has been conceptualized to make the factory as functional as possible while allowing visitors to see engines in action through skylight windows: rosters, chocolate blenders, crushers and conches. These outdated old machines from the first half of the 20th century, bought in Italy, Germany and Austria were restored with the help of specialized craftsmen. 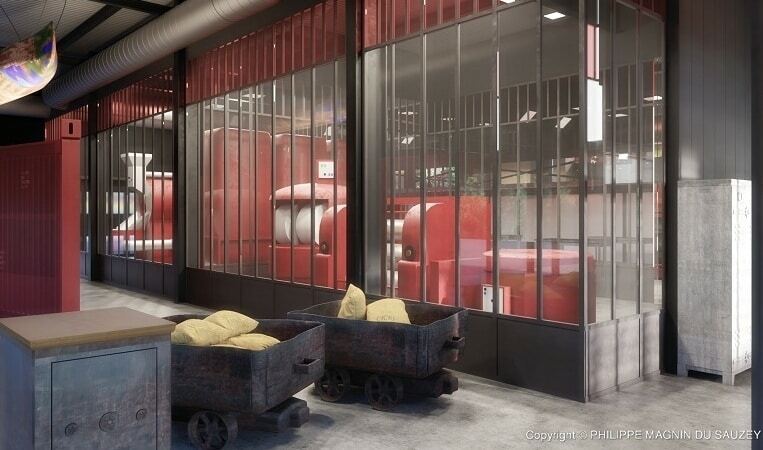 “We changed granite molds, updated electric diagrams, and painted the machines in red”. Richard Sève is as fascinated as visitors (if not more) by what these “magical” machines can do transforming a raw natural material into a noble product by crushing beans: “It’s quite extraordinary giving that we just add cane sugar: we do not use any additives, vanilla included to get a natural typical product reflecting a terroir (piece of land) and a specific variety of cocoa plant”. Foodies are not disappointed as the tour includes a free tasting at every step of the process. You don’t have to worry about the supposed bitterness or astringency of cocoa beans which may want you to spit them out. “Our cocoa nibs are so fine and even tasty that we are going to sell them in the museum’ shop”. These cocoa nibs match perfectly with some dishes. “You can sprinkle a meat cooked with a sauce with cocoa, use them with fresh salmon, pasta or risotto. That’s so delicious and good for your health”. Fine cocoa is indeed one of the few food products to lower bad cholesterol while rising good cholesterol. Visitors have also the opportunity to taste some of the house famous specialties at the end of the tour including macaroons and pink praline tarts. “We want to teach customers how they should taste chocolate as a glass of wine using senses from the smell to the cracking sound which can be starkly different depending how long the chocolate heated”, Richard Sève told This Is Lyon. If you would love to replicate some of these delicious pastries for you and your family, you can attend a 2-hour cooking class in the factory’s kitchen whether you are an amateur or a seasoned cooker while getting direct advice from bakers. The exhibition and the factory itself reflect Sève’s bold ambition to control all aspects of chocolate making despite the number of challenges as big industrial factories have monopolized the world chocolate production since the 1950s. “Industrial manufacturers want bakers to believe that making their own chocolate is impossible and not part of their job which is false as we are doing it along a dozen others pastry chefs in France. Apprentices are not even learning how to make chocolate! It makes me angry. It’s much more exciting to made pastries with high quality natural products you select yourself”. An old-fashioned risk-taking approach often seen as unrealistic giving the early financial investment and the large number of customers needed to sell all the production but that may well soon become trendy again following the success of micro-breweries and small coffee roasters.“Many of my fellow pastry chefs pursue the same aspirations”. 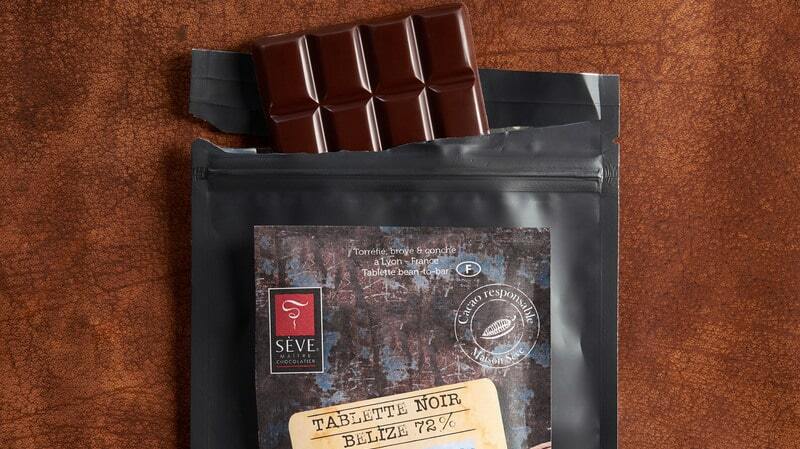 Richard Sève is considered as one of the best chocolate makers in France. His success story has begun 25 years ago when he bought with his wife Gaelle Sève a 1905 quality house in Champagne-au-Mont-d’Or where the bakery’s old factory was located. Their business has grown significantly over the years with the opening of five shops in Lyon including two corners at the prestigious Paul Bocuse covered market known as Les Halles and within Galeries Lafayette department store in Part Dieu shopping mall. Wednesday to Sunday: 10am-7pm (6pm on Sunday). Fares: 9 Euros (7 euros for children). Reserve a workshop at [email protected] individual (68 euros), kid & parent (98 euros), prestige classes with Richard Sève (150 euros).